You probably followed recent reports of the evidence in the claim against Mike Ashley. The trial judge handed down his judgment today in the High Court. This final paragraph admirably encapsulates his findings. "In the course of a jocular conversation with three investment bankers in a pub on the evening of 24 January 2013, Mr Ashley said that he would pay Mr Blue £15 million if Mr Blue could get the price of Sports Direct shares (then trading at around £4 per share) to £8. Mr Blue expressed his agreement to that proposal and everyone laughed. Thirteen months later the Sports Direct share price did reach £8. But no reasonable person present in the Horse & Groom on 24 January 2013 would have thought that the offer to pay Mr Blue £15 million was serious and was intended to create a contract, and no one who was actually present in the Horse & Groom that evening – including Mr Blue – did in fact think so at the time. They all thought it was a joke. The fact that Mr Blue has since convinced himself that the offer was a serious one, and that a legally binding agreement was made, shows only that the human capacity for wishful thinking knows few bounds." The case was Jeffrey Ross Blue v Michael James Ashley  EWHC 1928 (Comm). We welcome BT to my Folder of Complaint Correspondence. You will see how, in a series of ways, BT botched its performance of a contract to provide me with wi fi; sought to insist that I had to talk to them at the second stage of its complaints procedure; and then, when a complaints manager came into the picture, acted with courtesy and efficiency. The moral is keep at BT under its complaints procedure until you obtain an offer you are prepared to accept - they are quick to come back to you though you may not like what they say - and if you prefer to follow the procedure through in writing, insist that you have a right to do so. Incidentally, the hub is brilliant....so far. My name is Scott and I am a Case Manager at BT. I am writing in regards to the billing complaint we had on your account. I can see we brought forward your activation date to the 16/6, as part of an on-going project to bulk fast-track customer’s activation date. You have expressed that you are happy with this as long as you are not charged until the original agreed activation date of 14/7. I can confirm that you have not been charged for your new service between 16/6 – 14/7 and charges will commence from 14/7. Your contract start date is also 14/7/2017, just to confirm. I apologise this has not been made clear as far but hope this email reassures you going forward. I can see from our notes you have requested contact by email – please to drop me an email or call me (see direct number below) to confirm you are happy to close this case. Thank you for your message. I note what you say. 1 Activating too early and contrary to instructions. 2 Delivering kit too early and contrary to instructions. 3 Delivering kit to wrong address and contrary to instructions. 4 Informing me that I would not be charged from 16/06/17 and subsequently informing me that I would be charged — and now informing me that I will not be charged! 5 Sending me a series of emails/letters requiring me to return the first delivered kit notwithstanding that it was misdelivered and in any event left with a neighbour (where it remains as they are currently away). All this nonsense (and more) has caused me considerable aggravation and wastage of time. I have spent over two hours trying to sort it out. This is time I can ill afford to lose and I expect you to compensate me for it. What is your offer? In relation to the misdelivered kit, you will need to make your own arrangements to collect from that address. I am not available to sort it out and I do not expect my neighbour to be troubled. I accept that the activation was earlier than agreed, however you will not be billed until the original agreed upon activation date of 14/7. I accept that the hub was delivered to the incorrect address, however the hub has been delivered on the 19/6 and you have not been charged any extra for this, nor been without service you haven’t paid for. The information regarding the billing and activation has not been clear and I stress again – I do apologise for that. I am sorry for the aggravation and time wasted. As a goodwill gesture from our end – I would like to firstly offer to refund your account £9.99 (delivery charge for hub), as a gesture of goodwill for the above. We will make arrangements to collect any surplus kit with that address. Please get back in touch when you can - to inform me if the above would be acceptable. Thanks for your time again, Mr. Gold. Thank you. I note the gesture but I hardly think that £9.90 value adequately compensates me for the aggravation that BT has caused me and the two hours plus it has taken of my life, spent on on-line exchanges, waiting and phone calls , etc. If I was a litigant in person on a small claim against BT (and I might be yet! ), I would be entitled to £19 per hour for time spend on litigation alone. Please reconsider. Our final offer for compensation on this matter would be to credit your account with £19 – in relation to what you believe you should be entitled to. Our notes show the time spent on interactions to ourselves is roughly 45 minutes but I also take into consideration the time spent between correspondence between yourself and I today. If the above is acceptable, please call/email me to confirm, if the offer is rejected – we would need a date and time suitable for yourself, to speak with my manager to initiate the process where you and ourselves have failed to come to a resolution. Thanks for your time again, Mr. Gold and I await your response. [d] conferring with my neighbour by text and email in respect of your misdelivery of kit and subsequently their non-availability to allow collection? What regard have you had to the aggravation you have caused me by making a mistake at every conceivable step of this wretched transaction? You appear to have allowed circa £5 which any reasonable business or person would regard as insulting, as I do. When I said I had spent two hours plus, I meant it. I have no interest in inflating my claim. I mentioned £19 ph previously (which you appear to have adopted as a basis for your second offer) to indicate what a county court judge would award for time spent by way of costs. I was not limiting my claim to £19 ph. I am a professional person and consider my time is worth more than £19 ph. In any event, you refer to crediting my account. If you are paying me any compensation then it should be paid “in cash”. Why credit my account? You will have gathered that I reject your second offer. Your manager should email me with his reconsideration and details of the next stage thereafter in your internal complaints procedure. To confirm – We could credit the amount I am offering to your bank account, if requested. I am still more than happy to apply this with your confirmation that this would be acceptable – however, as you have confirmed below, you wish to start the next stage of the escalation process. This will require a conversation by call between yourself and my manager. We will not be able to continue the process by email. Please reply to this email with a date and time that suits you best or give me a call on my direct number below. As above, we cannot continue the process requested by yourself by email and this will be last correspondence until you get in touch by phone. If we do not hear from yourselves within 28 days, we will close this case down and you will receive confirmation of this. Thank you for your message. I see that you ignore most of my comments. I note your second paragraph and also that your manager appears to have an invincible fear of expressing himself in writing. Please send me a copy of the conditions of what you describe as an escalation process (which I take to mean an internal complaints procedure) so that I can see the basis on which I am told I must speak to you. Scott has passed your complaint to me in line with our escalation process. Firstly please accept my sincere apologies for both the inconvenience undoubtedly caused and the time you’ve had to spend dealing with the errors that has been caused. I am also sorry that Scott told you that we would not deal with your complaint by email. Although it can sometimes be quicker to resolve complaints over the telephone, it should, of course be your choice. I’ve reviewed you complaint and can see the problems you’ve encountered and the time you’ve had to spend on what should have been a very straightforward process. I can assure you that I have arranged any necessary feedback and coaching for advisors when things have gone wrong. I will arrange for the hub delivery charge to be removed as it was delivered to the wrong address. We can’t begin to put a price on your time but as a gesture of goodwill I would be happy to pay £25 into your bank account by way of an apology. I hope you’ll accept my offer and we can draw the matter to an amicable conclusion. Thank you for your message. I find its terms to be courteous and reasonable and will accept your improved offer. Details of my bank account to be credited are set out below. I do not know whether Scott’s last message was based on a template. If it was, I think you should review it. I found its penultimate and final paragraphs to be aggressive and totally unreasonable. I am not easily intimidated but I believe many customers would be if communicated with in this way. It may be good to talk. It’s also good to email! I’ve arranged the refund of £25.00 to your bank account today, you’ll see it within 3 – 5 working days. I understand your comments regarding previous emails and can assure you that has been dealt with. I’m pleased we’ve been able to resolve the matter amicably. I have today received an empty blue plastic envelope from BT - no covering letter or note - which I assume was intended to accommodate the return of the misdelivered kit. It was sent to the correct address but, as you know, the misdelivered kit was left with my neighbour at the wrong address where it remains and I made it clear that I expected you to collect from the neighbour and not to put my neighbour to any inconvenience and me to further embarrassment. So will BT get it acts together and strain itself to arrange to collect from the neighbour and not expect a third party to be put to trouble through BT’s incompetence? Or is that expecting too much? Thank you for your email, I’m sorry you’ve had to come back to me. The only option that we have to collect the hub from your neighbours would be by courier. I am conscious that as we can only specify a day for this and not a time it may put them to further convenience. I will ask that this hub is not chased any further and suggest that either yourself or your neighbours keep the hub as a “spare” for future use. The MasterCard Case: what's it all about you Breakinglawyers? See http://www.breakinglaw.co.uk/2016/11/make-note-18-january-2017.html And having seen it, take the champagne off ice and try and give it to the next door neighbour in return for him mowing your lawn. The Competition Appeal Tribunal ruled yesterday that the collective proceedings for compensation against MasterCard which Walter Merricks wished to bring on behalf of 46 million consumers could not proceed. The claim was not suitable to be dealt with in this way because of difficulties in ascertaining any aggregate loss which may have been suffered by so many people and, quite apart from that, because of difficulties in dividing any aggregate amount proved among so many consumers so that each of them would end up being compensated for actual loss they had suffered. Many onlookers will have been surprised by the decision. Certainly, Walter Merricks was surprised and is considering an appeal. We shall see and keep you informed. Perhaps hold on to the champagne for a bit longer and I'll pop round and mow your lawn (if you buy my book). A clutch of changes in certain family cases come into force on 7 August 2017. For that, you can bless or curse (depending on whether you love them or hate them) the Family Procedure (Amendment No 2) Rules 2017 SI 2017/741. You start off a divorce etc or civil partnership dissolution case with a petition. Unlike certain other documents you have to produce along the way, it hasn't been necessary to verify the contents of the petition with what is called a statement of truth. We are talking about a short sentence which makes it clear you have not not told a pack of lies and which you sign. If you have in fact told a pack of lies in the petition, the presence of the statement of truth means you may be held to be in contempt of court and for that you could be potted or fined or have your assets seized. Nasty. Well, as from 7 August, the petition will have to contain a statement of truth although petitions without a statement of truth will still be accepted by the court if received before 5 September 2017 !!! If an application is made in matrimonial or civil partnership proceedings for some financial order (maintenance, transfer of the family home, pension share and the rest) there are three potential hearings - a first appointment at which the judge gives directions about such things as valuations of assets and disclosure of information which should have been provided but has not; then a financial dispute resolution appointment at which the judge will encourage and assist the parties to reach an agreement without the expense and acrimony of a contested hearing; and then, if there has not been a settlement at the financial dispute resolution appointment or following it, that dreaded contested hearing. Sometimes the parties or their lawyers will try and duck the financial dispute resolution appointment on the ground that it is a waste of time and money and that the parties are intent on fighting it out for a couple of days in court. As from 7 August there will be an even greater emphasis than now on that financial dispute resolution appointment taking place. The court will be obliged to order it unless there are exceptional reasons which make it inappropriate. For much, much more about how to deal with a financial case like this if you are involved as a party and how not to get stitched up, you may wish to consider investing in a copy of my book Breaking Law (plug, plug). The court may allow a party to apply to a court in England and Wales for a financial remedy after a divorce etc or civil partnership has been dissolved by an overseas court. Permission for that is required. As from 7 August there is a change in that the default position will be that the permission application will not be notified to the other party and also the application will no longer be required to be heard by a judge in the High Court. Petra Ecclestone (daughter of former Formula One boss Bernie Ecclestone) is reportedly seeking to have set aside the pre-nuptial agreement she entered into with husband James Stunt. As their name suggests, pre-nuptial agreements are sometimes made by the parties to a marriage or civil partnership before they commit. Such an agreement won't be watertight. It could go right or it could go wrong. When challenged on a financial application which follows the breakdown of the relationship, the court may uphold it or reject it. To be upheld, the agreement must have been entered into by the parties with a full appreciation of its implications. Duress, fraud or misrepresentation by one party to the other and the court will chuck the agreement into the waste bin. And probably do the same if one party was subjected to undue pressure to sign up. The agreement must also have been fair to both sides and with each party making a full and truthful disclosure to the other about their financial circumstances. You'll find a draft pre-nuptial agreement in my book Breaking Law (which will save you a nice few bob in legal fees) and there's also a draft agreement where a couple are intending to cohabit together without getting married or entering into a civil partnership. The cohabitation agreement has a much stronger chance of being watertight than a pre-nuptial agreement although Breaking Law puts cohabitees wise about how they might succeed in outwitting the cohabitee who turns out to be a right rotter. This is about any litigant who cannot take no for an answer. It could be you. Or it could be your opponent in court proceedings. Let's take repeated applications in the same case. As an example, the county court frequently sees a series of applications for a judgment to be set aside which each time is based on the same argument. If you are on the other side and the first application is thrown out, you should ask the judge to certify that the application is totally without merit. When the second but identical application is heard and thrown out, you should ask the judge to certify in exactly the same way and, at the same time, make a limited civil restraint order. This will prevent yet another application in the case being allowed without the prior permission of the judge so you will hopefully be spared a third, fourth and fifth day off work. If repeated claims are made or repeated applications (or a combination of claims and applications within the claims) which are totally without merit then the court can make the more severe extended civil restraint order. This will prevent the opponent from making further claims or applications relating to any identified matter (for example, that "The defendant Stephen Gold winked at me outside Waitrose and thereby caused me to swallow the sweet I was sucking which gave me acute indigestion and so I claim damages and and an injunction to forbid him from winking at anyone in the future.") for a period of up to two years although the order may later be extended. To justify this the obsessed litigant must have acted persistently. But how many claims/applications do you need for that? Three will do. That's what the High Court has just ruled in CFC 26 Ltd and another v Brown Shipley & Co Ltd and others  EWHC 1594 (Ch). In this same case, the judge held that the court could take into account claims and applications made by someone other than a named party. So, for example, if you brought a hopeless case in your own name and then brought two other hopeless claims in the name of a company you owned which all raised the same nonsense then all three cases could be reckoned when the court came to decide whether you had been persistent. Should you be the one not taking no for an answer, be warned that your conduct is almost certainly going to earn you orders for costs against you. The small claims costs protection will be of no help. We've been here before (see http://www.breakinglaw.co.uk/search/label/nonsense). Here we go again. Yes, it’s me - your favourite complainant. A nice piece of dangiing metal on the third floor of your Richmond-upon-Thames car park - YESTERDAY! It is the very same piece which was the subject of a previous complaint of mine and which was purportedly repaired. In its present state of dangle, the metal presents a danger to bonce and vehicle bodywork. I do realise that health and safety must be extremely tedious and time wasting for your Partners but if someone could possibly break off from attaching a price indication to the display of sapphire grapes which was missing yesterday (the absence of which was the subject of a separate previous complaint of yours truly) and strain themselves to pop up to the third floor and effect an efficient repair, I am sure that the bodies of your customers and their vehicles would be eternally grateful. I see that Waitrose has been pipped at the post by M & S as Supermarket of the Year. My commiserations go to you but by way of consolation, I was contemplating putting forward Waitrose as the Disrepair Supermarket of the Year and wondered whether you and your CEO would think this a good idea. Finally, would it be possible for you to add coffee which is decaffeinated to your stock of drinks which are available fee of charge to those of your customers who satisfy current terms and conditions? I drink only decaffeinated coffee and I wanted to know that a stimulating drink would be readily available to me should I by chance bang my head against something dangling on a future visit to the Richmond-upon-- Thames store. I've spoken again with the branch manager. He has told me he will ensure his team include these issues in regular walks of the facilities to ensure any issues like this are addressed straight away. He would like to thank you for your feedback. He has contacted our maintenance department again to review this and take any necessary actions. You should be able to get a decaffeinated tea from our self service areas for your myWaitrose drink, and you should be able to get a decaffeinated coffee in our cafes, although you would need to make a purchase in one of our cafes to take advantage of this. What's all this about, then? I used to be solicitor to the Kray Twins. When Ron Kray died from a heart attack in March 1995, the pathologist removed his brain. Given the cause of death, I was perplexed by that action but within a couple of months I began serving as a full-time judge and so was unable to personally pursue any investigation as to why this was done and what had become of the brain. But in my book Breaking Law I described the steps I had taken as I approached retirement as a judge towards discovering the truth - never too late! - and promised to update readers in my blog. So here goes. 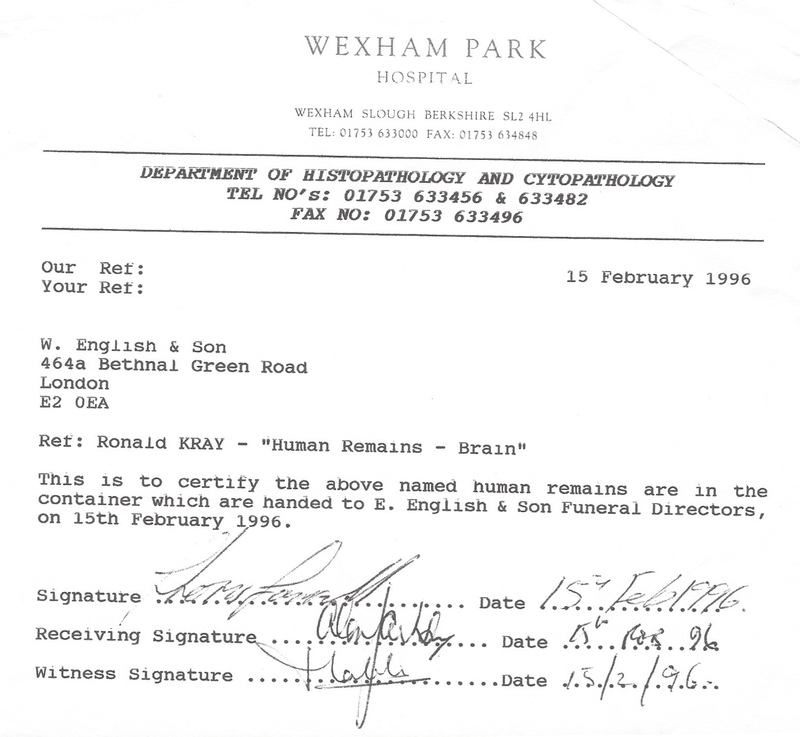 I have established that the brain was released to the funeral directors E English & Son by Wexham Park Hospital at which the pathologist (now retired) was based 11 months after it had been removed. It was in a casket which was then buried in Ron's grave. That's the receipt for the brain which you see above. But where had it been during those 11 months? In his post mortem report the pathologist stated that he had "retained the brain for further examination by Neuro pathologist." "I understand that at the time of Ronald Kray's funeral the brain was not buried with the body since it was still subject to an investigation to establish the cause of death. I am informed that the necessary consents were obtained from the coroner for East Berkshire." "If organs or tissue are required to be removed for further examination to establish cause of death, the decision is taken by the pathologist under the direction of the coroner." "Arrangements for the care of the material are a matter for the pathologists involved." The coroner had informed me in April 1995 that the inquest which he had already held into Ron's death had not been notified to Ron's family. It had taken place in his office and he had heard oral evidence from a police constable. He was satisfied that Ron could be "signed up" as a routine case of someone who dies naturally by reason of heart problems and indeed he gave a verdict of death by natural causes. There does not appear to have been any good reason for removing the brain if not for research purposes and for that there was no consultation with relatives. And another matter. Although the pathologist maintains that the brain was sent to the John Radcliffe, the NHS Trust responsible for that hospital say to me that "the Trust did not receive the brain at any point." 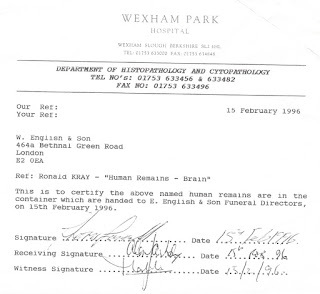 It maintains that it received only brain samples including blocks and histological slides but not the whole organ and that it received a referral from Wexham Park to provide a post-mortem neuropathological opinion on Ron in.....March 1996 which was after the brain had been returned. The pathologist accepts that he took "25 blocks." If, as claimed, the brain did not reach the John Radcliffe, where was it between removal and return in the casket? I would not want any organs removed from my body unless I had donated them, it was really necessary for diagnostic reasons or I had consented during lifetime for the purpose of research. Nor would you. That's why I have been at pains to find out what happened in Ron's case and why. But I haven't finished! What happened about the testing of Ron's brain samples at the John Radcliffe? I have sought disclosure of all written reports from the Trust under the Freedom of Information Act 2000. Disclosure has been refused as being exempt on the ground of confidentiality. And so I have since complained to the Information Commissioner. In a decision just issued the Commissioner has ruled against me on the ground that a duty of confidentiality was owed by the John Radcliffe to Wexham Park. There was no finding that such a duty was owed to Ron. I had argued that no duty could have been owed to him in respect of information created after his death and the Commissioner acknowledged the "obvious complexities" surrounding this issue. I have decided not to appeal against the Commissioner's decision. This is because I am satisfied that there was no testing of the brain samples before March 1996 and I believe that the samples tested did not reveal anything abnormal: in particular, they did not reveal any pathological explanation for Ron's mental condition. For more of my dealings with the Krays, take a look at Breaking Law.